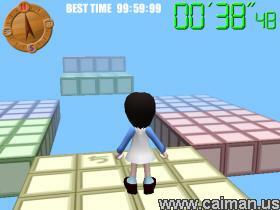 Caiman free games: Race Walking 3D by Keio Digital Vertex. A Japanese game inspired on the old Amstrad game "Trail Blazer". A game in the style as SkyRoads and Voidrunner, but now with a walking girl! 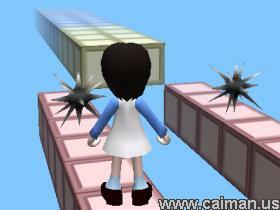 The goal of the game is to reach to finsh as soon as possible, by walking and running over the roads and jumping over the gaps and obstacles. 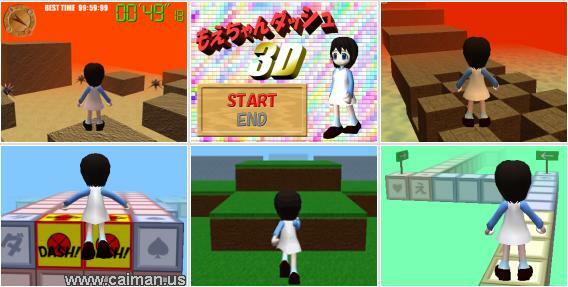 The game has 15 levels. Or you can use a gamepad. You can change the speed of the game by editing the md3d.ini with a text editor (as Notepad). mirror download (LZH file - no install) 5,38 MB. mirror download 2 (LZH file - no install) 5,38 MB. Patch (in case of problems - I didn't need it) 228 kB.